In-ground pools are great but installing one in your backyard may not be feasible due to limitations in your budget, space or soil. An above-ground pool is a great alternative as you can enjoy it even in the winter. Numerous designs are available for above-ground swimming pools. Styles range from affordable models to luxurious ones. You can use most above-ground pools throughout the year. Some feature the saltwater systems common with in-ground pools. Above-ground pools offer a variety of energy saving features such as energy-efficient covers and solar heating systems. Modern models may come with upgraded features typically found in in-ground pools. These features include pumps and filtration systems for cleaning. Even with all these systems, above-ground pools still need regular maintenance. Resist the temptation to procrastinate maintenance of your above-ground pool because it’ll come back to bite you through expensive pool problems. The most effective way of making sure you maintain your pool properly is having a weekly maintenance checklist. 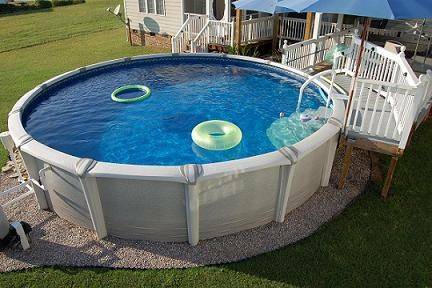 Issues with water circulation are common with above-ground pools. As a result, algae easily breeds especially in the pool’s deadspots as they have the poorest circulation. These areas include the back of ladders, under the skimmer, around steps, and in any cracks. Circulation problems occur in these areas regardless of how effectively the pump circulates water. Setting up multidirectional return jets might improve the situation. But you may still need to use a pool brush to circulate the water manually. You need to attend to the pool walls as keenly as the water in the pool. Don’t encourage guests to sit on the pool’s top rail or edges as the may crease or crack. When constructing the pool, make sure the custom pool contractors build it such that the pool walls are clear of potential causes of trauma such as tree branches and objects thrown by kids. Winterize the pool when swimming season comes to an end. Start by cleaning the pool thoroughly. You may need to add a chemical kit to the water. Remove the ladder, cleaning supplies, and chemicals for storage in a dry area. Run the filter for about an hour before removing the pump and motor for safe storage. Make sure the water level is below the skimmer and return. To prevent damage to the pool resulting from hydrostatic pressure, avoid completely draining the pool. Add pool anti-freeze and set up threaded winter plugs to block water from entering the pipes. Don’t use vehicle anti-freeze. Finally, use a winter cover to cover the pool.